For more than a decade Rod MacDonald has been a staple of the contemporary singer/songwriter world. This classic CD -- originally released in Europe -- includes some of Rod's personal favorites. Born and raised in Connecticut, Rod began appearing in New York's clubs and coffeehouses in the 1970s. After a three-year stint of national touring, Rod settled in the Village to become one of the driving forces behind the growing singer/songwriter scene there. In the mid-1980s, Rod co-founded the Greenwich Village Folk Festival, a free annual gathering that always attracts some of the city's best-known and up-and-coming performers. Originally issued on LP in 1987, "White Buffalo" was reissued on CD overseas by Brambus Records, but has never been readily available in U.S. retail stores until now. 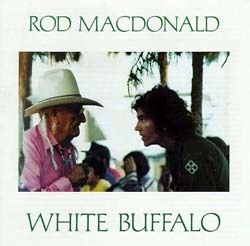 In addition to "White Buffalo", Rod has released "No Commerical Traffic" (1983), "Highway to Nowhere" (1991), and "The Man on the Ledge" (1994).